Love the latest updates but I can't wrap my head around the different sample play modes and the needed playlists with the new file handling. put about 20 different folders in the root. All folders have a different name and contain <100 stereo 44,1-16Bit wav samples. so far so good. I renamed playlist.txt to playlist.txt.txt (because windows hides the txt as it recon as extension. Still no luck. What am I missing here? Do i need different playlist.txt for each algo like in earlier firmware? and if so where can i find the right names? not in the manual. Can't seem to play wavetables too. No error message just nothing. Zip and post your actual playlist files here and I'll take a look. Nothing I have will decompress that file. Please could you try again? Use zip perhaps? Just noticed though that your playlist-wavetable.txt is in the ZMASSIF folder. It needs to be in the root of the card, as do the waveform samples. Copy/paste the files from withing the wavetable folder to the root. Wavetable algo works fine now. Thanks. Gonna try to delete all playlist.txt files within folders and keep 1 in root to see if this solves the problem. So I get this straight... One creates playlist-wavetable.txt file with default values, and folder names (up to 100 folders?). Does one then create another playlist-wavetable.txt file in each folder with file wavelengths (up to 100 per folder)? The wavetables are listed in the standard playlist format as above, but with the dedicated name "playlist-wavetable.txt". Each entry is either a WAV file (as in the other playlist formats), in which case the file is assumed to contain all the waveforms concatenated, or a folder name. If a folder is specified in "playlist-wavetable.txt", the folder contains the individual WAV files that represent one waveform each. The algorithm does not use any 'playlist.txt' file within the folder – any files found files are used in alphabetical order. Compared to 4.7 wich playlists should sit in root. Just multisample and wavetable? You can optionally use one for sample playback algorithms as well. If a playlist is found in the root of the card, it will be taken as a list of folders in which to look for WAV files. If a playlist is found inside a folder of WAV files, it will be used to determine which files to use, the order in which to use them, and to set the per-file options. Thanks, and for multisample playlists nothing chnaged i still need to find the midi note number for the root key to have correct layout on a keyboard? All the actual playlist settings are unchanged, so yes you still need to specify root notes for the multisamples. I updated to 4.9 and rearranged the Sd Card. Only Multi and Wave txt files. All folders in root. Txts within folders where needed. 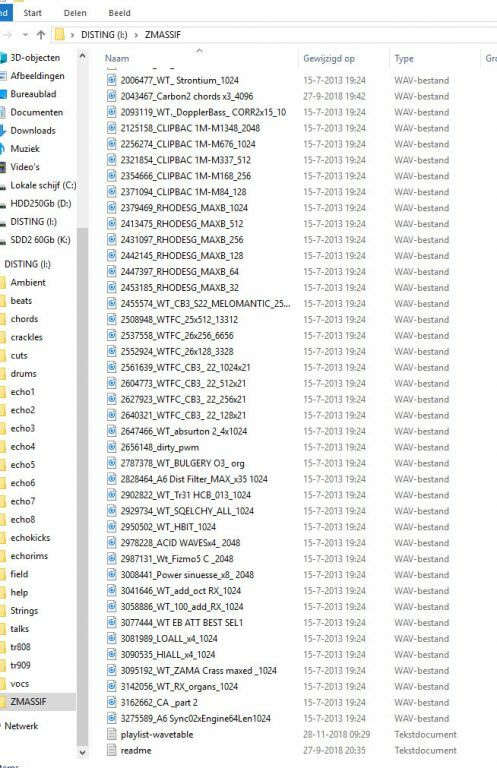 Now i adjusted the Multi txt of course but the J6 as other algorithms aswell show and select all 55 adventure Kid wavetables before the other folders. Clicking through 55 folders every time is very annoying. Before the update these wavetable folders where ignored by other algorithms. How can i reset it that way? Multi seems to ignore its playlist. Also it stops at 100 folders ? So with 55 being wavetables i cant acsess all folders. Ready to roll back to 4.7 or is there a solution? You can create a playlist for the WAV playback algorithms listing only the non-wavetable folders. Or, name your folders so the wavetable ones come last. Good idea about renaming alphabetical so i wouldnt loose the tables. But in my folder listing multi playlist the tables arent namend and yet appear. Also they appear on all other algorithms. 'playlist.txt' in the root folder. Cool that should take care of it. It will however not allow me to use another order for Multi then for the other wav algorithms right? Or is that playlyist.txt exclusing Multi anyway? Multisample playback (J6) uses the same playlist as other playback algorithms.